There is so much for me to write about and so little time. I have been pretty busy the past week or so. But sadly there are far too many things that I want to write about but don’t have the time, so unless someone creates an eighth day to the week and gives us a twenty-eight hour day I don’t know how I will be able to do it. So tonight I have just a short thought. Tonight I watched the American men and women swim teams cap off an amazing Olympics as the 4×100 Relay teams took gold. The American swimmers won 16 gold medals of a total 33 medals. The highlights of their performance in Rio are too numerous to list, but the their accomplishments set a standard of excellence and sportsmanship that we all should try to emulate, even if we are not swimmers. The see Michael Phelps conclude his Olympic career with 23 Gold medals of 28, the most of any Olympian ever was amazing, even when he lost the 100 meter Butterfly to a young man who idolized him. But tonight, he as well as teammates Ryan Murphy, Nathan Adrian, and Cody Miller. Murphy swam a world record backstroke leg to set the Americans up for the win. 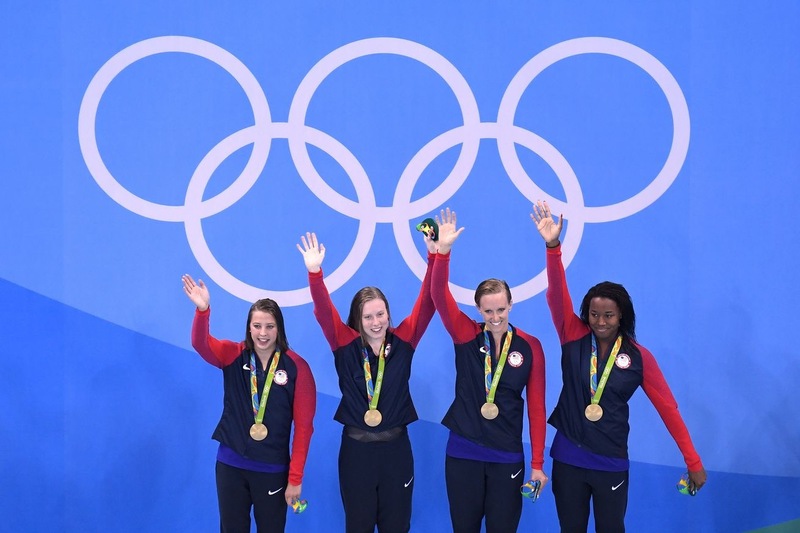 The American women concluded their campaign with the win with the team of Kathleen Baker, Lilly King, Dana Vollmer, and Simone Manuel winner the 4×100 relay. Three of the four women were in their first Olympics, and Manuel, who took two gold and two silver medals in the games was the first African American to medal in Olympic swimming. That is very important from a historical point of view. During the Jim Crow era, African Americans were prohibited from most public and private swimming pools, and as a result, swimming was not a sport that African Americans had much of a chance to excel. As in so many other areas of life, in swimming, blacks were considered less capable because they were racially inferior. Simone Manuel, an American whose public demeanor made us all proud exercised the ghosts of Jim Crow and has set a standard for others to emulate. I cannot forget Katy Ledecky’s dominance of the freestyle races, nor Lilly King who stood up to a Russian swimmer who had previously been identified as a user of PEDs. I was happy to be able watch all of the swim meets and proud to see Team USA do so well and in the process be magnanimous in victory. I have got to see lots of the Olympics and loved them. I saw the Giants beat the Orioles also. Finally thank the lord. Capital l.